The month of November is a special time for me! rem: Welcome, Clara Bess, so glad you could join us. Clara Bess: I’m so happy to be here. rem: It’s an exciting day, isn’t it? Clara Bess: Indeed it is. rem: You’ve quite the story to tell. What went through your head when you found your birth certificate. Clara Bess: My first thought was why wasn’t it in with the other documents. Then I noticed the name but it still didn’t register. I thought maybe it wasn’t mine—somehow they didn’t put my last name on it. rem: That would explain how Lily registered you for school. Clara Bess: Yes, and how I got my marriage license. Momma—Lily—just showed them the birth certificate and never told them otherwise. No one questioned it. We were a close-knit community. rem: Connie tells me you two were quite close. Clara Bess: (chuckles) I adored her. From my earliest memories, I was attached to her like bees on a honeysuckle vine. I followed her everywhere, I mean everywhere. rem: I understand you had an incident with hornets. Can you tell us what happened? Clara Bess: It was the strangest thing. I picked berries all the time and never saw a hornet. There were plenty of them over in Old Man Darby’s Meadow, but we knew to stay away from there. rem: But this particular afternoon, there was a nest right in the midst of your blackberries. Clara Bess: Frank confessed to me years later. He couldn’t have been more sheepish and remorseful. He said he thought I’d get one little sting, only intended it as a practical joke. He had no idea I was deathly allergic, or that they would swarm me. rem: What an horrible thing to have happened! I’m so sorry. rem: Let’s back up a bit, though. What was life like before you found the birth certificate? Clara Bess: Oh my goodness! I had such a charmed life! A real live fairy tale. Except for Derik there was no blip or anything really ugly in my life at all. It was like I was a walking lucky charm. Clara Bess: (sigh) He… was a… distraction. Let’s just leave it at that. rem: But then you met Roger. Clara Bess: He swept me right off my feet. I wasn’t looking. All I wanted was to raise my baby and start my own bakery. rem: And along comes Roger. Clara Bess: Yes, along comes Roger. rem: You two seem like such a solid, happy couple. Clara Bess: Oh, we are. Even through this nightmare, he’s always been my rock. I am a blessed woman. rem: Tell me about your bakery. 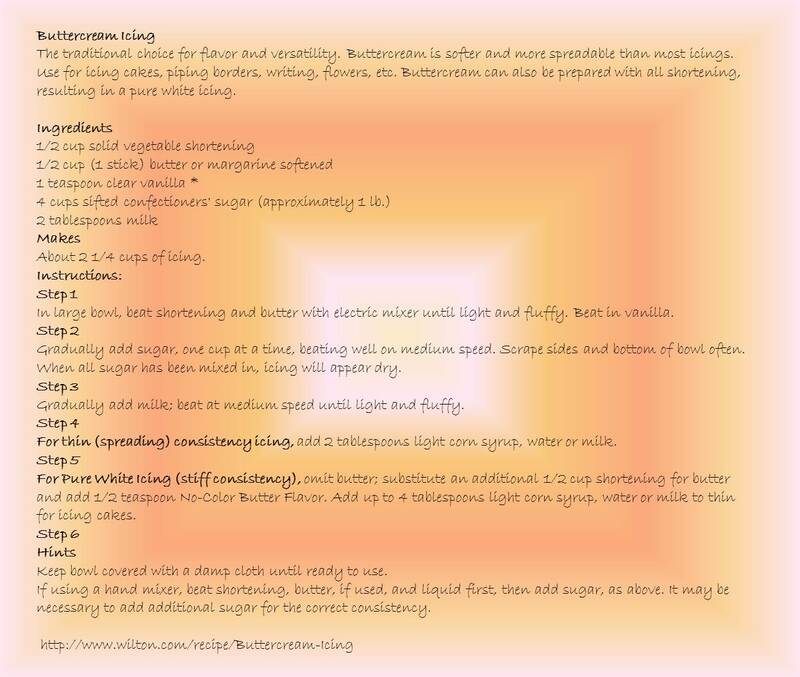 How did you start baking? Clara Bess: Oh my! I don’t ever remember not baking. I was helping Momma out for as long as I can remember. Clara Bess: I first saw those at the State Fair. I was hooked and learned to make them. rem: In your honor, we are serving those at the launch events today. 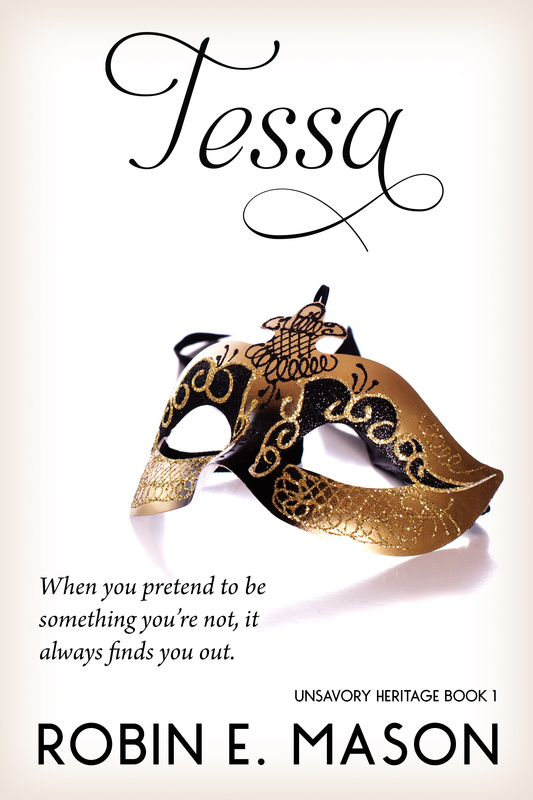 Clara Bess: Why, I’m quite honored. Thank you so much. rem: Clara Bess, thank you for being with us today. I appreciate you taking your time to visit with us. Clara Bess: It was nice being here. I know you’re going to love the macarons! If you haven’t already, be sure to stop by and like my Facebook page, follow me on Twitter, on my blog! Please leave me a comment, let me know you’re here! Clara Bess developed an affection for the confection at a young age—and learned to make them. Smiling, Clara Bess tilted her head, thinking back to the first time she saw the divine bonbon. They had been at the state fair. At eight years old, she had won blue ribbons for two of her finest cobblers: one a blueberry almond, the other a variation of her blackberry walnut sticky buns in cobbler form. As they looked over other entries, her eyes fell on a colorful display. “Ooohh, what are these?” she asked the woman packing them up; they had won the red ribbon for second place. The woman caressed the ribbons with care; she had been the blue ribbon winner for four years running. Lily laughed and nodded. She knew once Clara Bess had a notion in her head, she’d not take no for an answer. “Oh, I don’t mind. Them’s lavender mint.” She handed a lavender colored macaron to Clara Bess. Macarons became her specialty, particularly lemon flavor. Clara Bess wasn’t raised by her birth mother. Nor was she adopted. “Clara Bess read, with shock and no small degree of confusion, the line on her birth certificate where her mother’s name should be. It did not read Lily Isabella Mayes. Posts this month address children who, for whatever reason, are not raised or cared for by their birth parents. 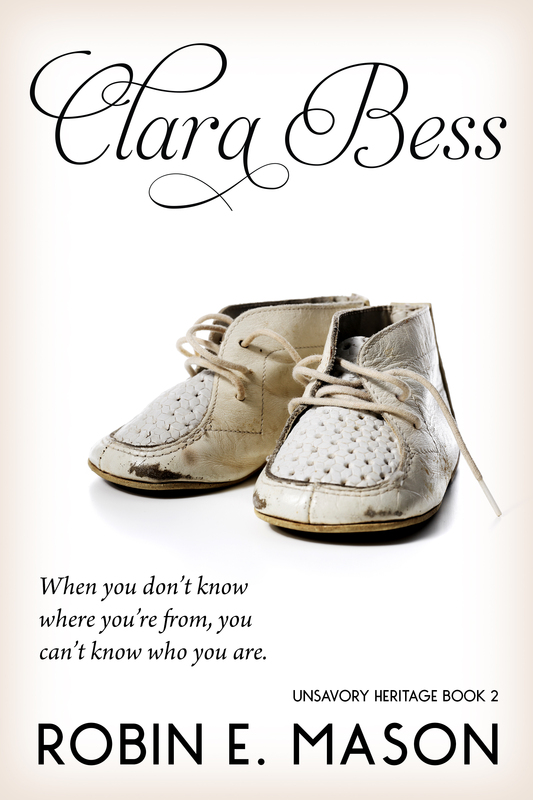 Clara Bess faces the journey of not only finding out who her birth mother was, but why she was raised with the family she knew. There’s not much in this world more terrifying than when your child goes missing. I know, it’s happened to me twice, one false alarm and one very harrowing experience. My oldest son tends to brood, and when he does, he’ll go off on his own to sort through whatever is on his mind. One afternoon when he was nine years old was such a day. I had scolded him for something and he went off to pout. I later called him for supper but he didn’t come down, nor did he respond. Not in the mood for his ill mood, I went to his room, but he was not there. I checked the (tiny) back yard. No sign of him. Nor was he out front. No. Sign. Of. Him. Anywhere. I checked upstairs and downstairs at least twice, every nook and cranny I could think of. There was a foot alley behind our apartment building and I checked there, even though the gate was difficult to swing. By this time, neighbors were in on the search, as dusk was falling rapidly. Someone drove to the nearby park, shining headlights into the retaining pond. No sign of my son. I checked upstairs and downstairs over and again. A neighbor checked upstairs and downstairs. I finally looked one last time, and there he was, snugged under his bedspread at the edge of his top bunk, quite hidden by the railing. And running quite a fever. He wasn’t missing, he was sick. I felt stupid for not having seen my own child; then again more than one other neighbor looked in the same spot and didn’t see him either. But he was safe. My second experience was not so pretty, although it ultimately did have a happy ending. My daughter was not one of those children who cried hysterically at being dropped off at daycare; she was one who cried when it was time to leave. She’s always been a social butterfly. When I went home on my lunch break my heart stopped—my front door was WIDE OPEN. And I knew. My child was not in the house. Fiancé was asleep on the couch—something I had done many times with the kids in and out. Turns out she put on her coat and shoes (I’ll never forget that yellow hooded coat) and wandered down the street looking for her brother. The lady in the rental office was new and didn’t recognize her, and at two years old my daughter wasn’t verbal enough to say, “Oh, I just live down here.” Rental lady called the sheriff, who call DSS, who put my daughter in a foster home. A foster home! This was on a Friday. A court date was set for the following Monday. The whole weekend was surreal, like a dream. Like my baby girl was asleep upstairs, safe and sound. I don’t know how I functioned for three days. When we got to court, the caseworker told me the case would not go any further, there would be no hearing, and he would bring my daughter home later that day. That was more than thirty years ago and I remember it like it was yesterday. It can happen so easily. No evil intent, no parental negligence. I hit the curb driving once because I sneezed; a child wandering off can happen just as quickly. While no child missing is a trivial case, there are some cases that are more critical, or higher risk. The younger the child, the greater the risk. As with my daughter, who could not speak for herself versus a child even a year older, who could answer questions about where he or she lives, or where is Mommie or Daddy. Children with health risks like asthma or diabetes that require regular treatment or medication are at higher risk. Autism presents a particular set of circumstances. Already high maintenance, nearly half of all children on the autism spectrum will wander off. One third of those are non-verbal. Immediate responders will need as much information as possible, for any child, but especially for a child with autism—unique interests or their favorite places, anything that might be particularly appealing to the child. Water holds a high attraction for children on the autism spectrum, and any bodies of water should be the first target areas for searchers to check. My former neighbor’s son is autistic, and he is fascinated with trains. A track runs along the edge of our neighborhood, and an inland port was built not long ago. For this child, that would be a primary target area for searchers. Some things that can be triggers for autistics, can also be attractions for them—bright lights or traffic lights, fire trucks, busy roadways or signs—the more detail searchers have about your child, the greater success in locating him or her. A key preventive measure in bringing about a successful search is to let those closest to the child know specifics about your child, favorite color, favorite food, particular interests, or things they’re afraid of. Not only will neighbors be well-informed when speaking with searchers, but they will be better equipped to assist in the search. 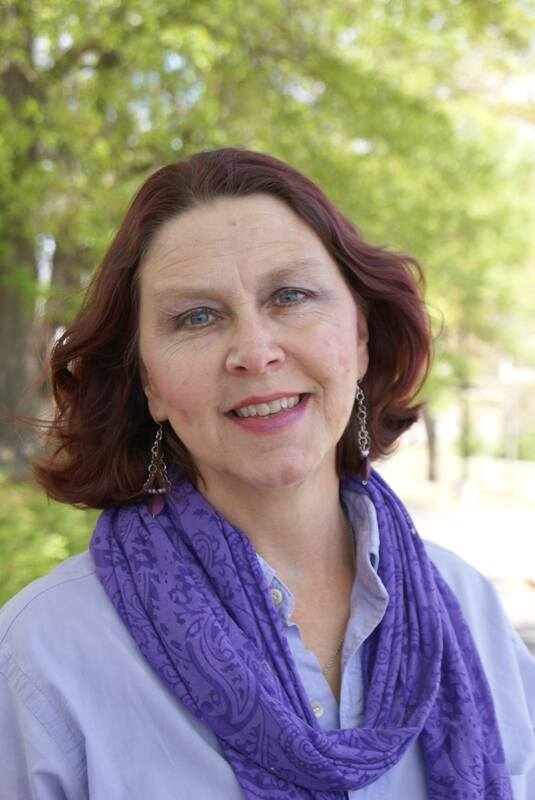 One of my favorite authors, Marian P. Merritt, has written a story about a son missing. For twenty years. Yet his mother never gave up. All common sense and logic urged her to let go, to move on. But she knew in her heart he was not dead. She knew she would find him some day. Some day. 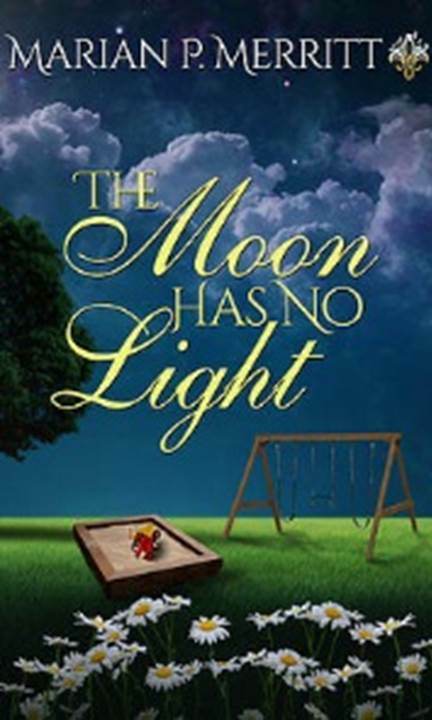 The Moon Has No Light was my second read by Ms. Merritt, and I highly recommend it, an intense and gripping read. As in Ms. Merritt’s story, a missing child is just as important to the parent after ten, twelve, twenty years, as he is the day he goes missing. The place in a parent’s heart that belongs to that child will never be filled by anything or anyone else. I found my information at http://www.missingkids.com. As of April of this year, the NCMEC, National Center for Missing & Exploited Children® has assisted in recovering nearly a quarter of a million children. Hard to fathom that many children missing, and that is their recovery rate. As much as no one wants to think about it, it is best to be prepared in the event that your child goes missing. NCMEC provides a checklist in the initial stages. First thing is to call local law enforcement immediately. Then call the NCMEC at 1-800-THE-LOST (1-800-843-5678) It’s a free call. Check closets, piles of laundry, in and under beds—especially under the covers—inside large appliances, vehicles, basement, attics, under the stairs (there was a closet under the stairs in the apartment where we lived when my son went “hiding.”) Check anywhere your child could crawl or hide. If you are in a store, notify the store manager. Be prepared to provide law enforcement with your child’s name, date of birth, height, weight and descriptions of any other unique identifiers such as eyeglasses and braces. Tell them when you noticed your child was missing and what clothing he or she was wearing. This has been a long post, and a not fun post, but a vital one. A sneezed and I almost wrecked my car. A sneeze while at a park with my kids and my child could be snatched. It can happen that fast. And cell phones! Don’t even!!! If you’re out with your kids, BE with your kids. Don’t text or Facebook at the playground. The results could be as deadly as any wreck on the highway. Awareness and preparedness are the greatest defense against anything happening to our kids. I hope my post has helped you in some way to understand, or to be prepared. Be involved with your neighbors. Be aware of kids on your street or your apartment building. Be part of the solution. This month has been about family. Tragedy happens, the unthinkable happens. And life keeps going. We are resilient creatures, we find our way back. We rebuild, we recover. We thrive. Not all stories have a happy ending, but we can make our happy ending. We grow as families, and we become the strongest and the best we can. sat on the balcony of the condo, cold wind brushing her face. Thanksgiving was tomorrow but she felt no thanks, only an aching emptiness. She thought back to the last Thanksgiving with her momma, and to her first Thanksgiving as a momma. Tomorrow would be a whirlwind, family—Heath’s family—boisterous laughter and merriment. She wouldn’t be expected to cook or bring anything, although she always picked up a tray of cookies from Duquesne Boulangerie. Maybe she’d order some extra macarons for Christmas this year. That quaint little bakery in Virginia made the best she’d ever tasted, and the peppermint ones at Christmas were especially delightful. Now, Marni stepped back inside and refilled her wine, went to finish packing; Heath would be home in an hour, ready to leave. No, she wouldn’t think about it, wouldn’t let the past encroach on the present. Wouldn’t let her Connie’s absence, even, put a damper on her already limp emotions, her fragile heart. Marni tilted her head and put on a happy face, her polished face—her practiced face—and embraced her mother-in-law. Wine and gossip were flowing in the kitchen as her sisters-in-law put finishing touches on their various dishes; Marni set her platter of cookies on the sideboard with the pies and cakes. Eight months pregnant, and as the hired help, Marni was serving the dinner. At least it was just Mr. and Mrs. Bales and their daughter, her charge, Molly. Marni had been hired as their nanny; when they discovered her cooking skills, Mr. Bales increased her wage to prepare and serve their meals as well. Marni nestled the platter at the end of the table, near Mr. Bales. Mrs. Bales, Carlotta, insisted that Marni join them for dinner. They had no family coming in; they would all be here for dinner on Christmas Eve. And Marni had no family. The crisp white linen tablecloth, the golden placemats and napkins. Crystal water goblets and wine goblets, fine bone china, and sterling silver flatware. Mr. Bales emptied his snifter of the last of his brandy and picked up the carving knife. Marni felt awkward sitting at the family table but Carlotta had insisted; she fought the urge to get up and serve rather than let the dishes be passed around. Marni had cooked the feast, prepared for days; rarely did she get to enjoy it as she did this day. Most days the family ate in the formal dining room and she ate after in the dinette area off the kitchen, or in the tiny kitchen in her quarters. After a glass of wine—Carlotta had also insisted—Marni relaxed some, and enjoyed the meal. They shared coffee and pumpkin pie, and family stories around the fireplace, and Marni tucked a sleepy six-year-old into bed before turning in herself. Now, Marni looked around the formal dining room of the Barclay family, her in-laws. She took in the laughter and family stories, some new, some retold and rehashed. Her heart smiled and she felt thankful to be part of such a warm family. Her misty memories faded, occluded by what was before her now, this moment. She closed her eyes and smiled. Noise swirled around like the winds howling outside. The family was no less boisterous than any other year, never mind her mother was gone. And just these recent weeks. How could Connie carry on like nothing had changed? Like Momma was upstairs for a nap and would be down any minute? Clara Bess stepped out on the back porch, the promise of snow whipping her hair across her face. She was as empty as her coffee mug. Inside, Connie had a monstrous turkey roasting, oozing with walnuts and cranberry stuffing. Corn, harvested just weeks ago, was simmering on the stove. Macaroni, laden with cheddar cheese, was bubbling in the oven. Sallie and Nancy Sue and Caroline were tossing salads and mixing cornbread. Sue Ellen was kneading dough for the dinner rolls. Sandy and April and Lexie were setting the table while the younger cousins were watching the parade on TV. “Oh, Con, I just miss her so much.” Clara Bess leaned into her sister. “I know, I do too.” Connie dusted snow from an empty wooden chair. They sat in silence. Dinner was the usual clamor, everyone talking at once, memories and new anecdotes competing to be heard. Clara Bess heard it all—and heard nothing. Nothing but a cacophony of noise. Later, in front of the fire, silence reigned. Clara Bess thought back to her first Thanksgiving as a mother. Before she married Roger, before she knew Roger, even. At eight months pregnant, Clara Bess was at home for the holiday weekend; she had returned to the McLaughlin campus for fall semester. Connie and Sallie were married, preparing their contributions to the meal in their own homes. Blythe was a career woman, cohabiting with Hector, and would be joining the family on Thanksgiving Eve. Clara Bess waddled around the familiar generous country kitchen, working her magic, bringing her baked creations to life. She had made the pound cake and the pies already, the dinner rolls and, of course, her pumpkin macarons. The clamor of family and love mingled now in her ears as it had those years ago. Celia—the unborn babe those years ago—sidled up to her now. Clara Bess lifted her chin in a demi-nod. And to my readers who have taken time from your Thanksgiving celebration, whatever that might be, wherever you are—and my friends not in our country—I bid you a most joyous Thanksgiving with every blessing. Thank you for being my readers and blog-followers. It is for you I write. Please leave me a comment, let me know you’re here! This post is mostly a bunch of pictures. Because, well, they’re fun. And pretty. And who doesn’t like a pretty birthday cake? 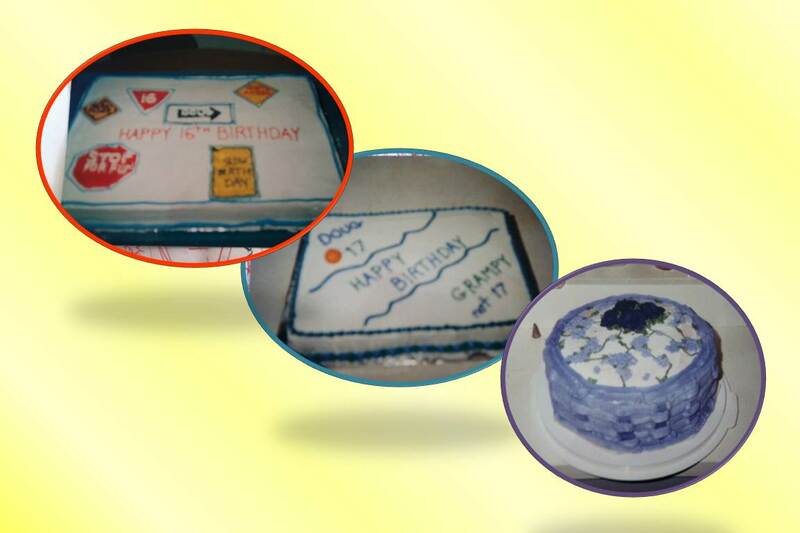 My grandmother decorated cakes for as long as I can remember. 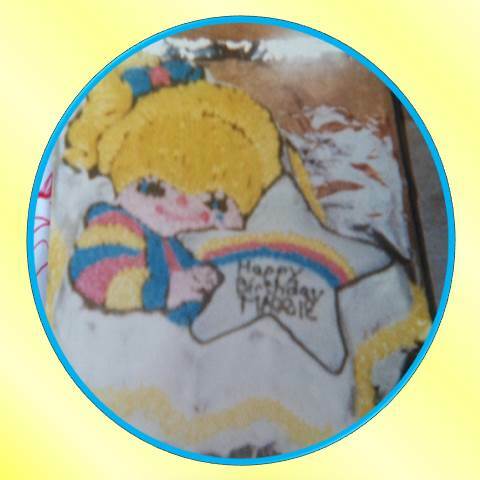 I used to love perusing her Wilton catalogues, and I guess it stuck with me; as much as I loved looking, I wanted to learn to decorate cakes, too. Fast forward several years. 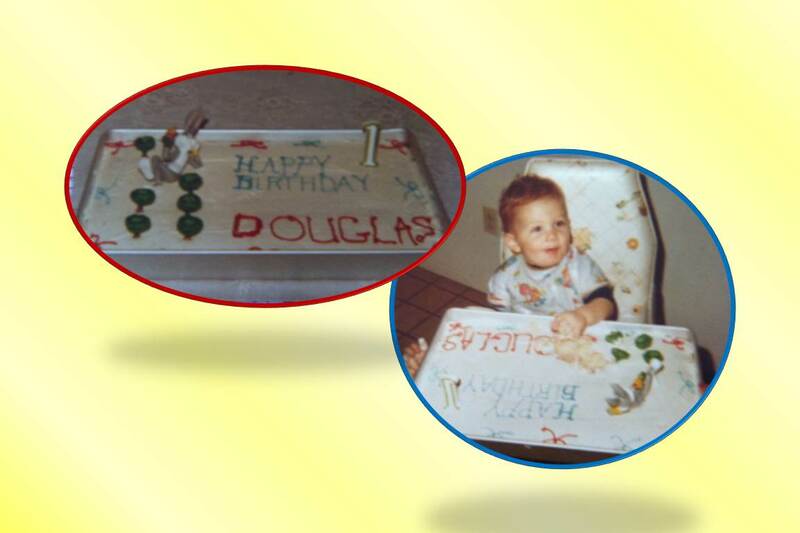 I don’t remember now if I used Wilton products at the time or not, but when my first son’s first birthday rolled around, I knew I had to make the cake. The decorations are Wilton, I do know that much—and believe it or not, I still have them! 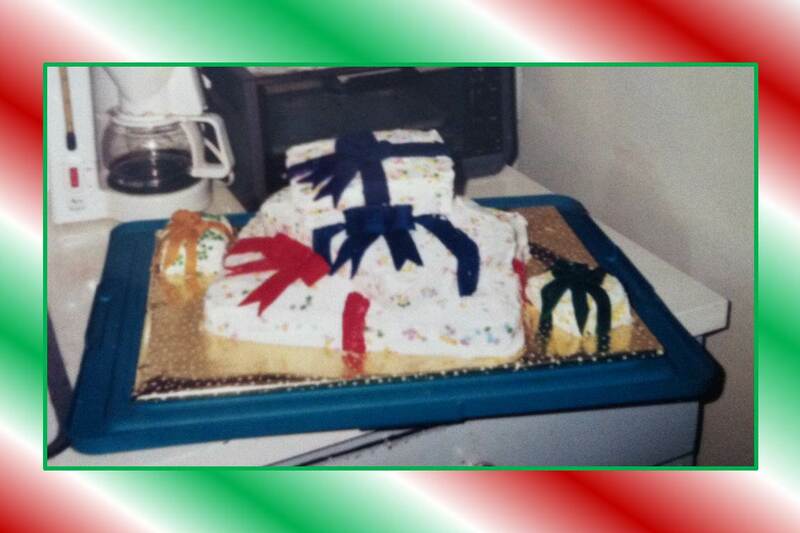 This was my first feeble attempt at cake decorating. 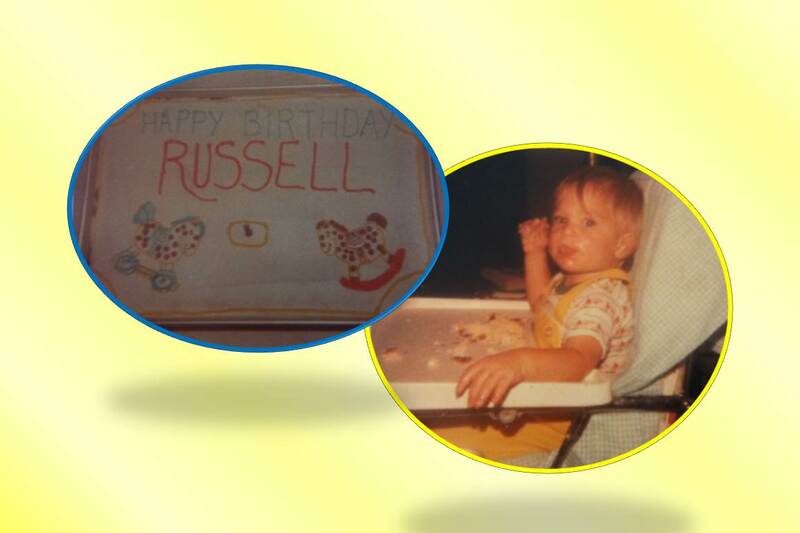 And this adorable little fella is thirty-seven today! I got more creative as I progressed, and I like to think, my skill improved. Boy-child #2, first birthday—the horseys on the invitations were inspiration for the horseys on the cake. And this precious fella is now thirty-five! As I experimented, I learned that my oversized pan took three cake mixes—not two, and not four, three. 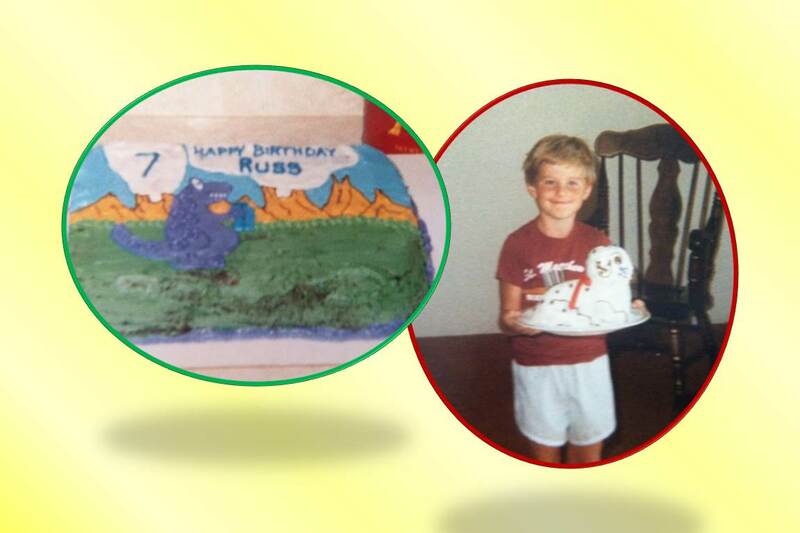 That’s brother holding the puppy cake for the pic—birthday boy got a Dalmatian puppy for his birthday. And the girl-child’s first birthday; she is now thirty-three. 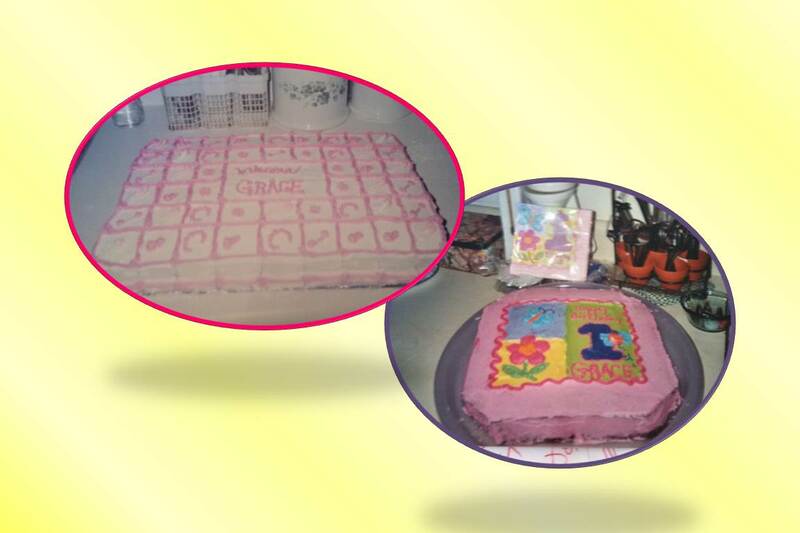 (She was fascinated with the butterfly on the cake!) 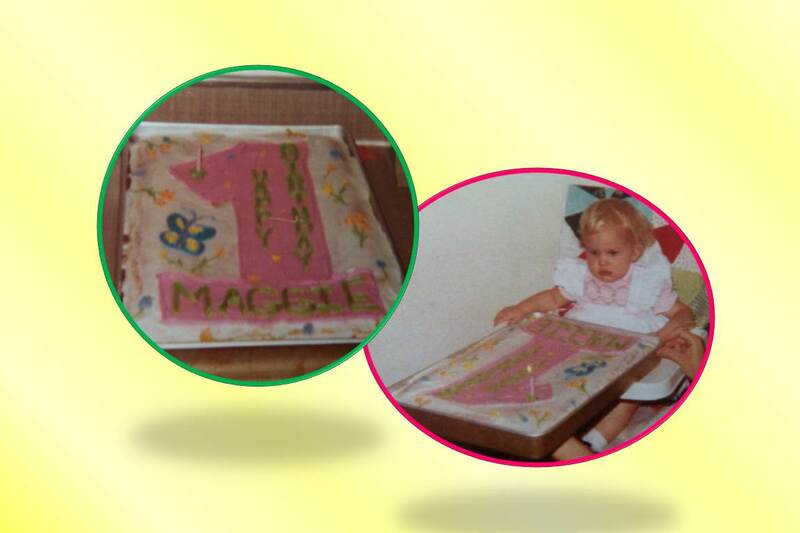 I eventually learned to turn the cakes onto a cake board—much more attractive that way. Also made several cakes in shaped pans. 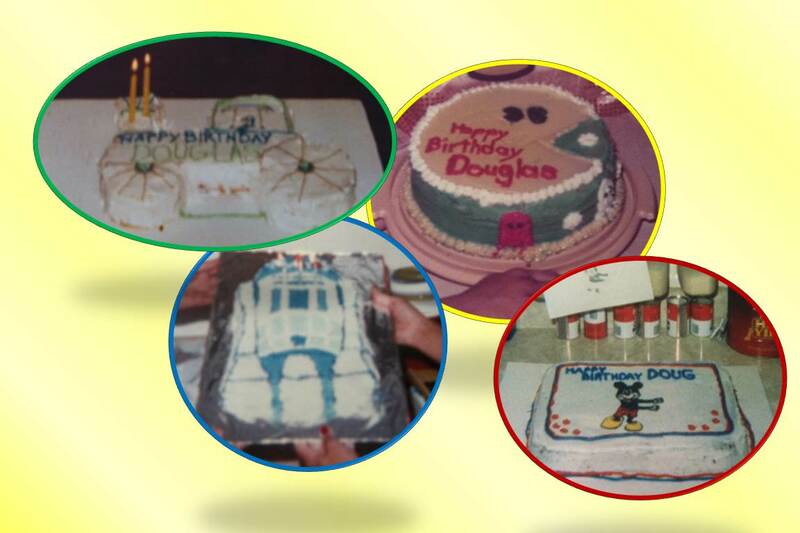 Some cakes from later years. 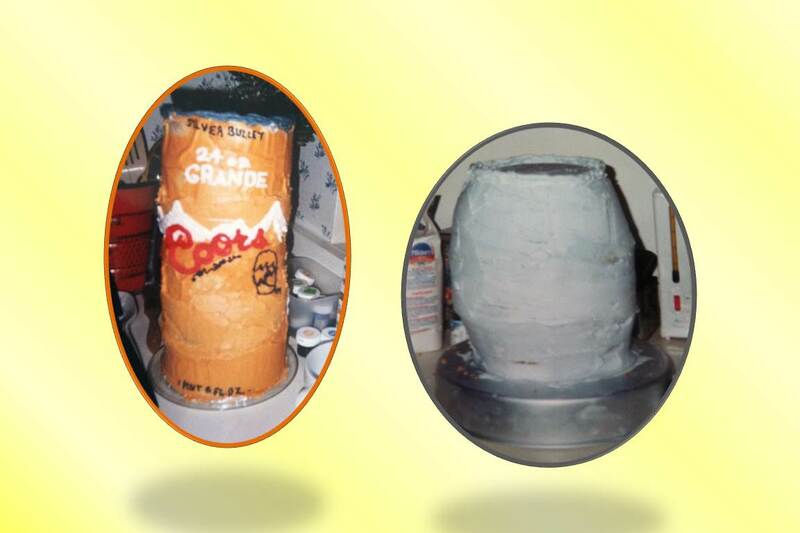 And yes, that is a can of beer—and a keg! Twenty-first birthdays. I have fun decorating, that’s for sure! 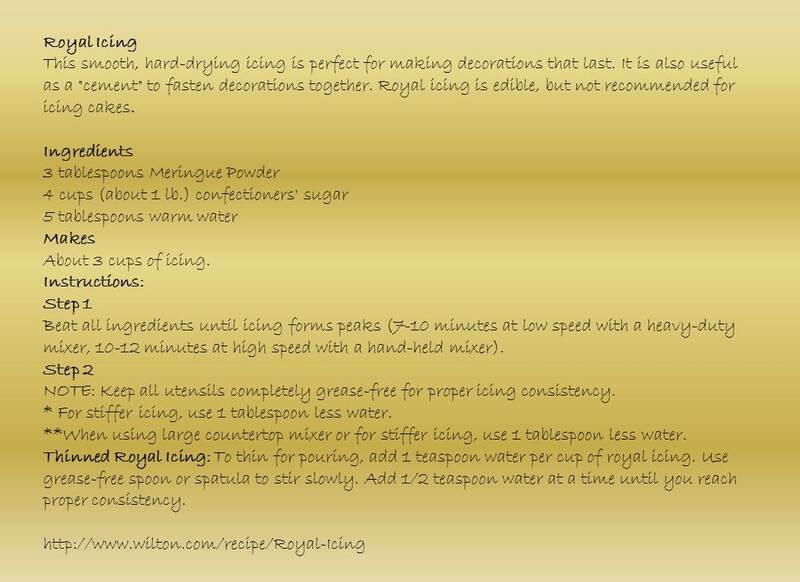 I can’t recall what I used on those first cakes, but when I took a Wilton cake-decorating class twenty-plus years ago, they taught us to use the Royal Icing. Now, however, I see that Buttercream is the icing of choice for decorating. 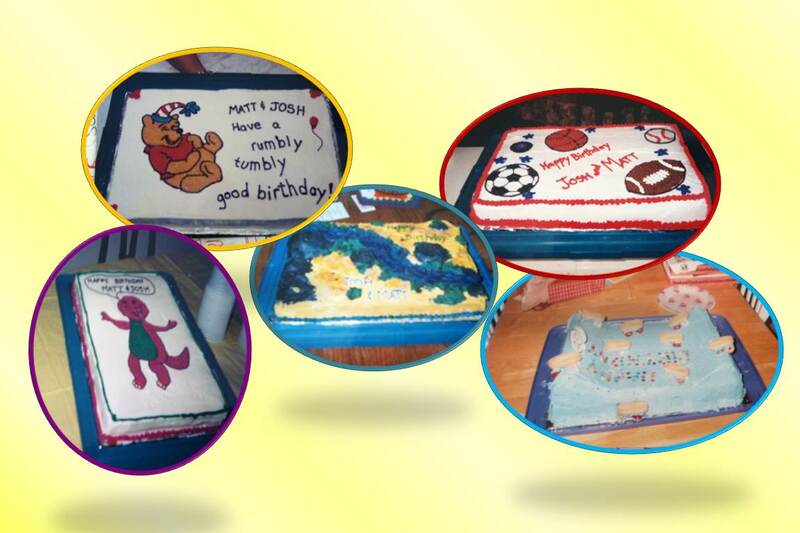 Rolled Fondant creates a smooth finish. 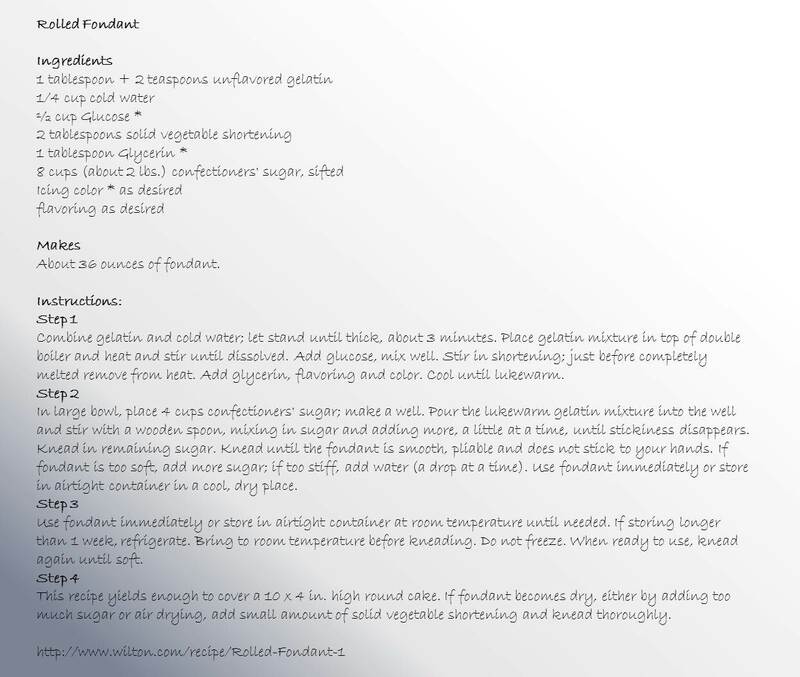 I’ve not used fondant, yet, but plan to attempt it. Maybe for the grandgirl’s birthday next month. In the spirit of Christmas, I gotta share this pretty cake I found on Facebook. And finally I close with a birthday cake I did for the king of Kings. rem: Good morning, Connie, welcome. Connie: Good morning. Nice of you to ask me here. rem: I understand you and Clara Bess were quite close. Connie: Oh yes, I adored her from the moment she was born. rem: So you knew she wasn’t your sister. Connie: Of course I knew. Aunt Rose stayed in her room most of the time but she wasn’t quarantined. She didn’t stay in the house though, she’d go outside and walk around, or sit in the glider under the trees. It was obvious she was the one who was pregnant. rem: What did you think when she left and didn’t take the baby with her? Connie: It was odd, anybody would think so. But we kids didn’t question adults, we knew better than to say anything. Besides, she said she’d be back to get her. rem: Did your brothers and sisters know? Connie: Frank did, he was eight, but the others didn’t really catch on. Blythe was seven but I don’t think she really understood. Sallie was too little; she was only four. And Herb and Boyd, well, boys just didn’t think about babies the way we girls did. rem: Tell me about you and Clara Bess. Connie: We had a special bond. Still do. Even as an infant, she would quiet for me when Momma couldn’t get her to sleep. She’d clamor for me from her crib or playpen. Once she was walking, she tagged along after me everywhere she could. Followed me when I did my chores—gathering eggs before school sometimes was pretty cold, walking out in the snow. But there she’d be, right next to me. rem: I understand you are quite the pianist. Connie: Yes, well, I guess you could say that. I do love to play. And CB would sit right next to me on that bench, watching my fingers. And darnedest thing if she didn’t learn my pieces with me. rem: I’d love to hear you sometime. Connie: (giggles) Thank you, I’m sure you will. rem: Did Clara Bess get along with the others? Connie: (pause) Let me just say yes, mostly, and leave it at that. There were seven of us and we had sibling rivalry and squabbles like every family does. rem: I see. I have a brother and a sister, and I raised two boys and a girl—how well I understand sibling squabbles. Clara Bess was your shadow, though, in more ways than one. Connie: Yes, we share the uncanny—freaky—resemblance. rem: And not just the two of you, if I’m not mistaken. Connie: Oh no, Momma was the same. So was Aunt Rose. We all have black hair, and the same blue eyes, and fair complexion. rem: Yes, I’ve spoken with your mother and your aunt Rose already. If I didn’t know better, I wouldn’t be able to tell the difference. rem: Now when Clara Bess discovered her birth certificate, what did you tell her? Connie: I didn’t know when she first found it—she didn’t tell anyone for the longest time. Poor thing. We talked about it, though, when she finally did say something. There wasn’t much for me to tell. I was only ten at the time; I just didn’t know much about what happened or why. rem: But you were her pillar through it all. Connie: You flatter me. Of course I was there for her, but she really leaned on Roger the most. Well, once she told him. rem: Any good girlie secrets between the two of you? Connie: It’s funny now, but when Will and I were courting CB had the biggest crush on him. He adored her—they still have a special bond. rem: Connie, I appreciate you taking your time to chat with us today. Connie: I enjoyed it, thank you for having me.